Kaye Dacus is an author and editor who has been writing fiction for more than twenty years. A former Vice President of American Christian Fiction Writers, Kaye enjoys being an active ACFW member and the fellowship and community of hundreds of other writers from across the country and around the world that she finds there. 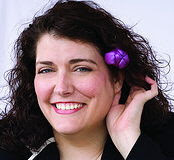 She currently serves as President of Middle Tennessee Christian Writers, which she co-founded in 2003 with three other writers. Each month, she teaches a two-hour workshop on an aspect of the craft of writing at the MTCW monthly meeting. But her greatest joy comes from mentoring new writers through her website and seeing them experience those “aha” moments when a tricky concept becomes clear. When wedding planner Anne Hawthorne meets George Laurence, she thinks she's found the man of her dreams. But when he turns out to be a client, her "dream" quickly turns into a nightmare. Will Anne risk her heart and career on this engaging Englishman? 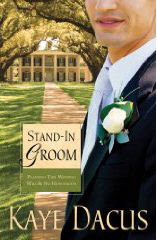 George came to Louisiana to plan his employer's wedding and pose as the groom. But how can he feign affection for a supposed fiancee when he's so achingly attracted to the wedding planner? And what will happen when Anne discovers his role has been Stand-In Groom only? Will she ever trust George again? Can God help these two believers find a happy ending? My Review - I was not at all sure about this book, it is really not my usual fare, but I was pleasantly surprised. The characters are very well written, instantly likable, and seem like old friends. The story draws you in very quickly, and I flew through this book. It is a wonderful story and I highly recommend it!